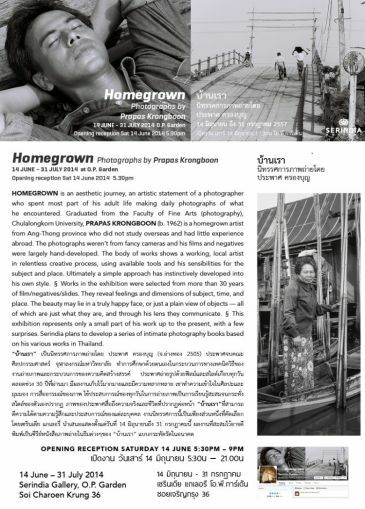 HOMEGROWN is an aesthetic journey, an artistic statement of a photographer Prapas Krongboon who spent most part of his adult life making daily photographs of what he encountered. Works in the exhibition were selected from more than 30 years of film/negative/slides. They reveal feelings and dimensions of subject, time, and place. The beauty lies in a truly happy face, or just a plain view of objects - all of which are just what they are, and their truth and beauty were brought out through Prapas' lenses.